2 by 3 Heroes: I get cards. And sometimes I post about them! I get cards. And sometimes I post about them! I can't say that anything horrible has happened in the 5 weeks since I last posted. Just things here and there have gotten in the way, and by the end of the day, I am either pooped, brain dead or in need of some distraction, so my cards have gotten pushed to the side. And more like piles upon my desk. I have too much to send out, a couple boxes I need to sort and piles to organize. But in a nutshell - family is healthy, nothing major gone wrong and surviving the best I can. 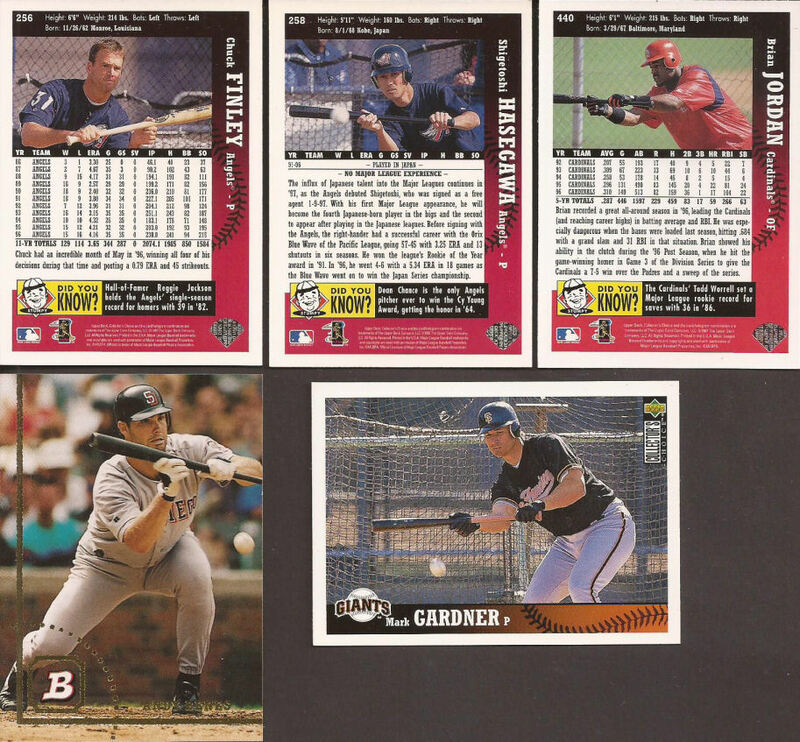 A PWE was received from Daniel at It's Like Having My Own Card Shop. Four simple cards, but 4 nice additions to the Sox box, including a rare ChiSox Junior. Without looking it up, can you identify the number he wore during his 41 game stint at Comiskey? Thanks Daniel. Chris at Nacho Grande had a few cards he put up on ebay. 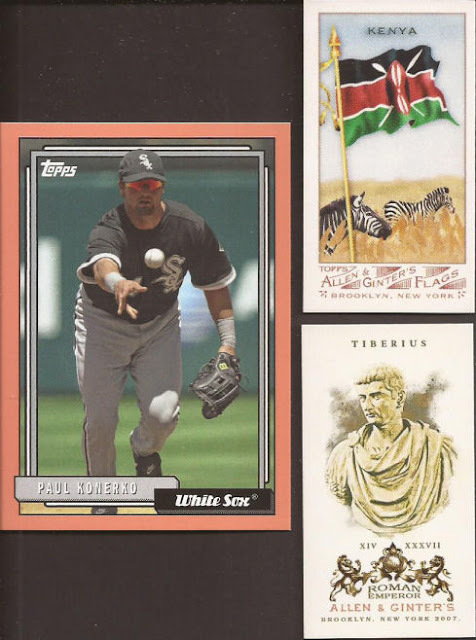 No way I was going to pass on a pink Paulie, and the two A&G minis are needed for earlier year insert sets I still need to complete. 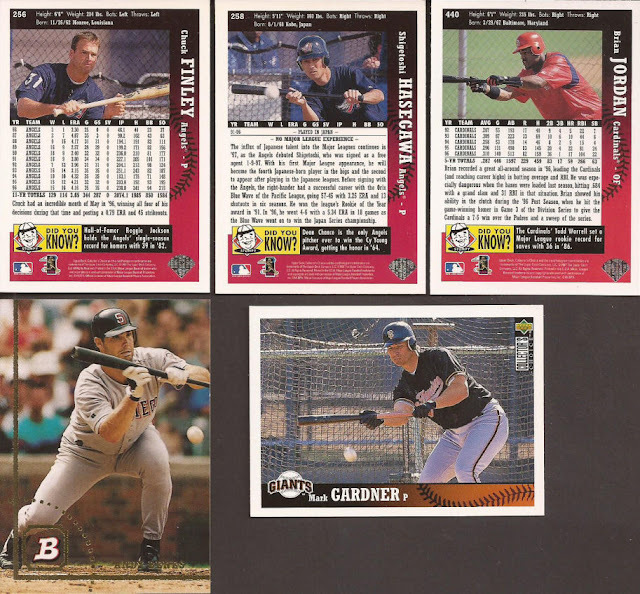 Fortunately, Reds fans seem to pull pink White Sox cards from Archives, as Chris included a few extras in the mailer. Appreciate the bonus cards, Chris. John, owner of Johnny's Trading Spot deemed it Christmas in July. Yes, I am THAT far behind on scans/posts and was not intending to post at Christmas time. Tons and tons of bunting cards for the binder. Collector's Choice seems to be a gold mine for binder cards. Maybe I'll run a report before Beckett shuts down Zistle. Though - who the hell knows what Beckett's plans are. And oh baby - dig those O-Pee-Chee!!!! 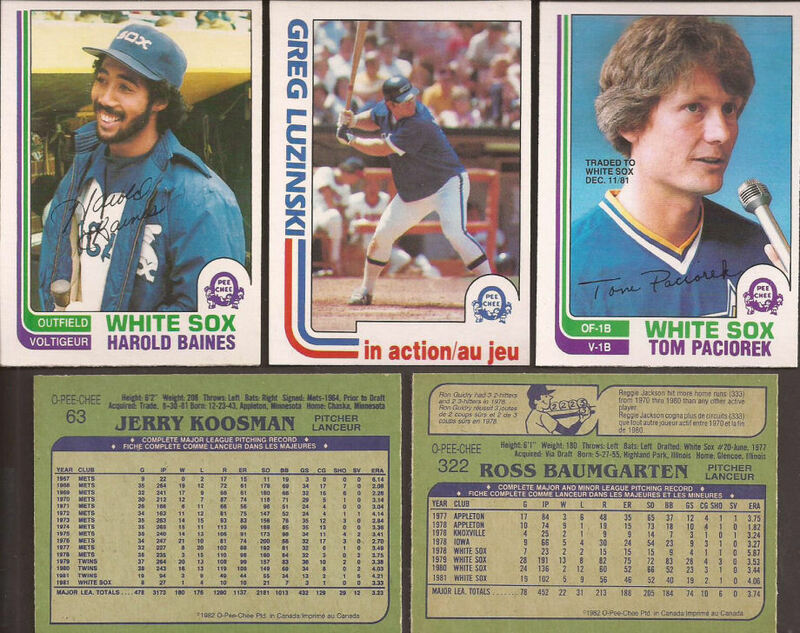 It's the older OPC that you can really tell a difference from their Topps counterparts. French just improves the hockey stick "In Action" cards by a factor of dix. 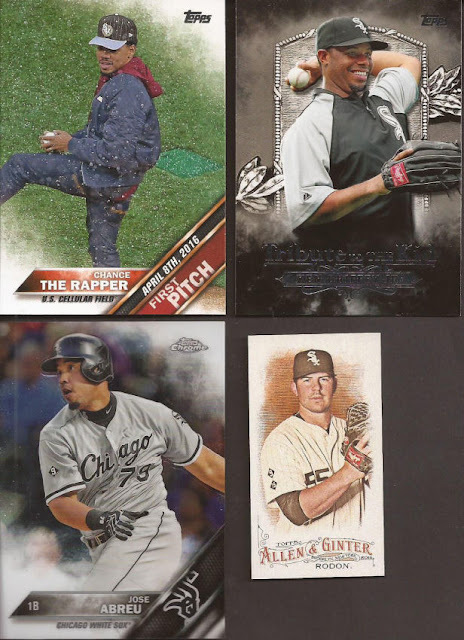 Last from John is a nice black foil Fulmer from this year's SC. That goes to the throwback binder. 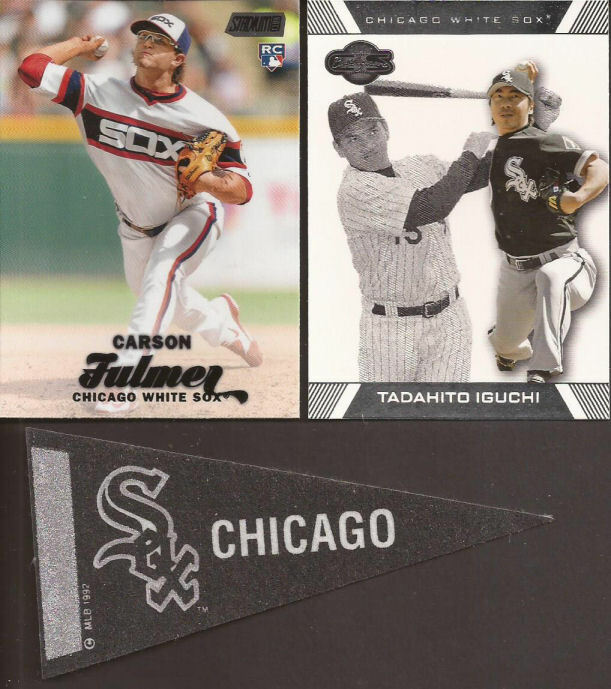 A new Iguchi for the player collection. Zippy told me that Iguchi retired and the Sox threw a little shindig for him back in Sept. I wanted to attend, but see paragraph #2. And how about a mini Sox pennant? Right now it is set underneath my left side monitor. When do pitchers and catchers report in 2018? Thank you for the Christmas gift, John. Last up is a purchase too good for words. Tom over at Angels in Order had a blowout on autographs. For a buck each, I couldn't pass up adding some Sox autographs to my binders. 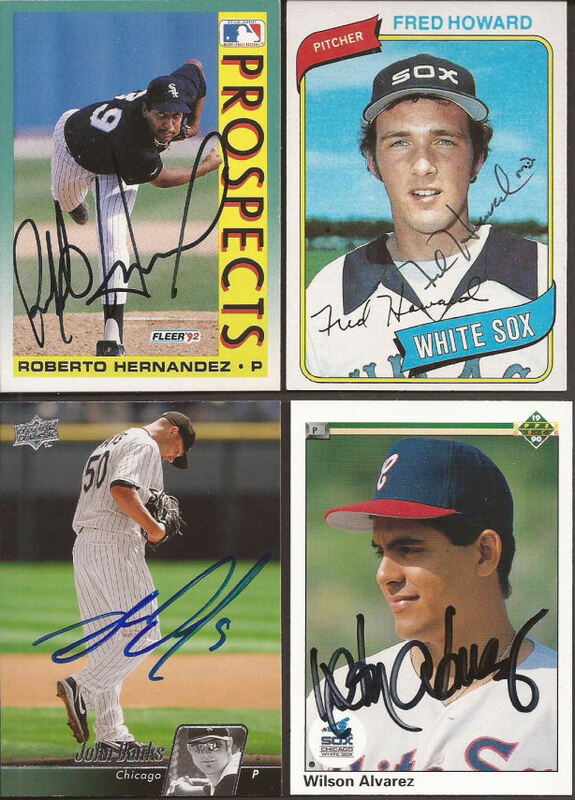 The Hernandez could be a dupe, if Roberto ever returns my TTM request from 2 years ago. The only Danks auto I currently have is just his scribble on a card without any picture. 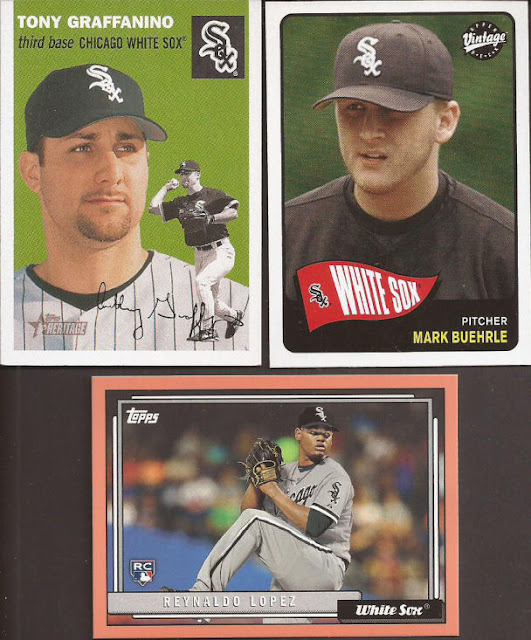 Alvarez was in the pipeline to mail out, but no longer needed. 3x5s are welcome at 2x3. Especially when you have players that a TTM request is just not possible. Hermann spent 8 years on the south side, becoming an all star in his final year with the Sox in 1974. He then bounced around the league for 4 more years, retiring in 1978. Ed passed away in 2013. 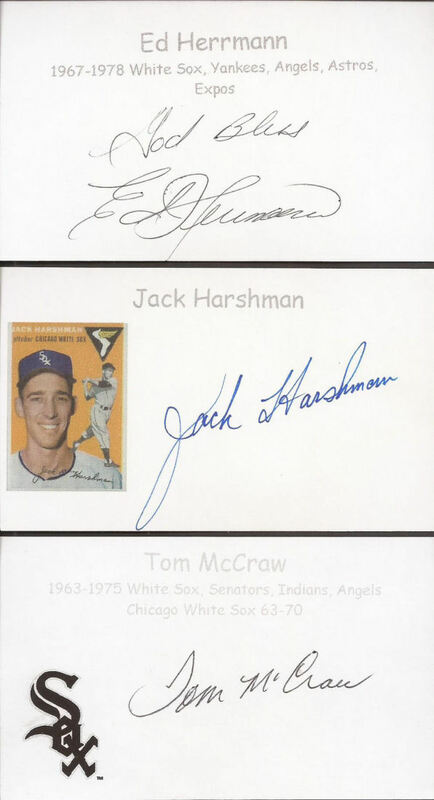 Harshman started as a first baseman with the NY Giants, but turned into a decent pitcher that the Sox picked up in 1950. Jack spent 4 years in Comiskey, then went to the O's in 1958. In 1959, he went from the Orioles to the BoSox to the Indians - all before the end of the '59 season, and finished his career the next year with the tribe. Jack also passed away in 2013. McCraw played with the White Sox from 1963-1970. Tom made the last offensive out in the Senators history, getting caught stealing against the Yankees in 1971. Tom is living in Florida and has a great TTM return rate if anyone wants to mail him. Great doing business with you, Tom. Ok - so that catches me up a bit. With luck, things will calm down and I can get back to my card posting roots. Glad to hear that everything is okay. I think we've all been there where everyday life and rest takes priority over blogging. By the way... I found another Upton relic for your nephew. I'll PWE it sometime in the near future. I've loved my autographed cards, but there comes a time when you have to thin out the collection. Glad you enjoy them.